You are viewing 106th place. Does this meet the criteria ? You get my dnmc 7. Fun frame. The cat seems to be playing with it, and it reacts nicely with the diagonal wood grain. I don't think this really meets the intent of the challenge. Cute cat. Looks like you might of done some overprocessing because the cat just doesn't look natural. Also, I fail to see how this meets the challenge since there isn't a Woody in the picture. Doesn't meet the challenge, and even so the editing just doesn't make sense. wow, you really put some effort into this one huh? There should be a wooden stick man in the photo. Also the border effect is somewhat bizarre. Just some thoughts IMHO that would improve this shot, please feel free to PM me if you have any questions. Topic: DNMC since no "woody doll" is present. Border: Seems the border is uneven and in better focus and color then the main center of the picture. Also seems strange how you composted this cutting the tip of the tail, head and paw out of the square. isn't there supposed to be a woody figure in here somewhere? The cat looks over-smoothed? What's the box over it? Sorry charlie, this doesn't fly. The challenge does show what type of 'woodie' to phtograph. Personal I don't like either of the effects you have used for this image as well. DNMC - Don't see a Woody. Oops! 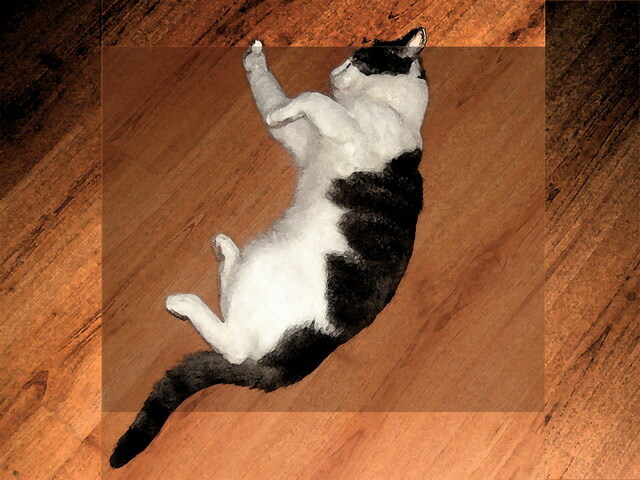 Nice floor - cute kitty - but not a wooden stick man (you know, from the challenge details). Don't worry, it's not the first time someone has missed the fine print of the challenge and won't be the last. :-) Good luck. I don't see the Woody? And the shading on the cat is strange. Not quite what was described in the challenge. Details: Include a Woody in your photograph this week. I don't believe you read the challenge description because I don't see a Woody figure in your photo. Was this an attempt at a brown (pun intended) ribbon ? And what the heck happened to the cat??? Proudly hosted by Sargasso Networks. Current Server Time: 04/20/2019 02:14:35 PM EDT.